I have removed hosting for the previous versions of this application and would ask that anyone who has installed them, please uninstall them. When I went to get an API Key for Google Maps I read the article about signing your application. I realised that I had been distributing an application signed with an insecure debugging key. I have created my own secure key and will sign any future versions distributed here with that key. Sorry about the gap between this version and the last. The application now has a Home Screen from which you can launch Capture Route. I’ve created an icon for the application and a menu icon for Capture Route. The first gps fix shown on screen is now a previously cached fix. 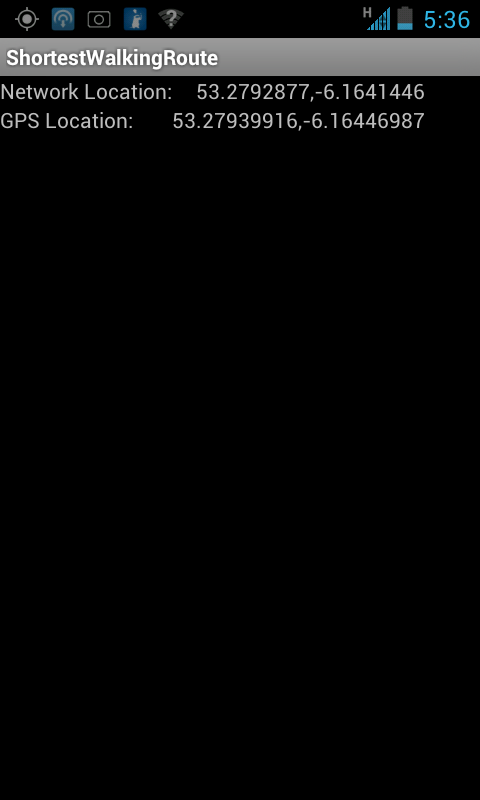 The application now requests a network fix once a second and a gps fix once every half-second. The network fixes will only be shown if no GPS fixes have arrived or if the last GPS fix was more than 2 seconds ago. 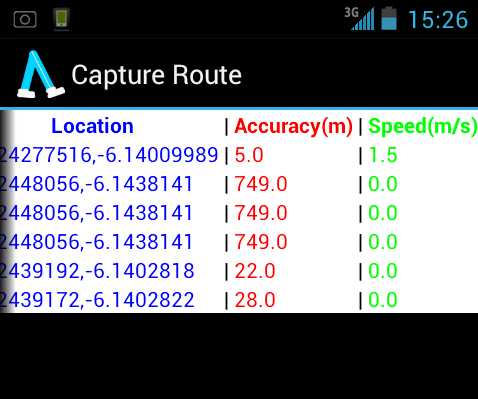 The Capture Route screen now shows the accuracy and speed of travel for each fix. The Target SDK for this project is now set to 11, which has magically made the UI more attractive. This version is the start of appearing different on different devices, so if you have a device running Froyo (Android 2.2) or Gingerbread (Android 2.3) let me know how it looks. I’ve decided (despite initial misgivings about adding complexity) that I will implement Android Fragments in Shortest Walking Route so it can have a attractive modern interface. If you do try this application please add a comment and let me know if it worked and what device you are using. This version will request GPS fixes for a minute, if you want to restart it, simply go back to the Home Screen (by pressing back) and run Capture Route again. Storage: The next step is the one I have been dreading slightly, but it’s time I figured out how to store my location fixes. I’ve decided to try an SQLite database, but as I have never used SQL before this is a step into the unknown. Wish me luck! The screenshot here shows the application displaying location data captured while I was standing still, previously when I had tested the application while still it had poured out pages and pages of coordinates. I was worried something was broken until I realised that the application was showing less data because it had such a firm GPS fix on me that it knew I wasn’t moving. When I had tested it before I had been in a building and it’s fixes had been sporadic enough that they could be movement. This version only updates it’s display when a GPS Location fix comes in, so Network Location fixes will not display on their own. It’s timer runs by checking if it has run for five minutes yet every time a GPS Location fix arrives, so if it cannot get a fix it will continue to run past 5 minutes until it does. Firstly I would like to look at some of the other things that the GPS system gives you, like accuracy, and direction. 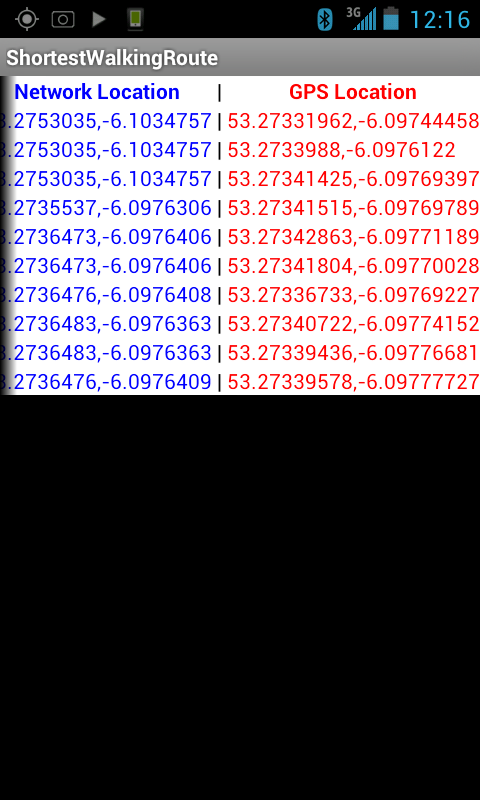 Secondly I will also break down the data and look at the difference between fixes instead of at the fixes themselves. Thirdly I will figure out a way to roll the Network and GPS Location into one usable variable. The first version of Shortest Walking Route is simply a test of the location services in Android. 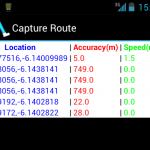 It shows the Network Location and GPS Location of the device and updates them as fast as android will deliver updates. Network Location is much faster to deliver a response than GPS Location. 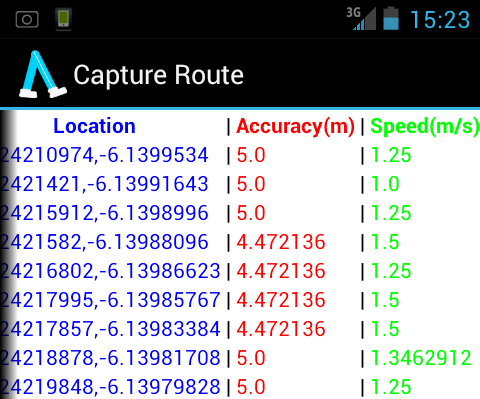 GPS Location is very detailed but will bounce around as it estimates location. It’s much faster to get a GPS Location when the WiFi is enabled on the device. Note: Once this application is running it will not turn off of it’s own accord, you will have to go into application management and kill it manually. Otherwise it will continue to grab gps information as often as possible until your battery dies. Next I want to configure the application to record gps information for 5 minutes so I can get a look at the difference between a moving handset and still handset. 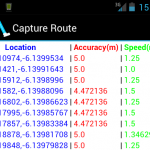 Shortest Walking Route is an Android application which allows the user to record different walking paths between two locations and see which is fastest on average.